SUCCESS for Teens has one goal: Helping teens transition from passively waiting for life to happen to understanding they can-and, in fact, must-pursue their dreams now. This book tells them how to begin. Through a series of real-life experiences from their peers combined with thought provoking exercises, teens will quickly grasp the necessity and reward of clarifying goals, practicing the small efforts necessary for success and boldly accepting responsibility for their own destinies. 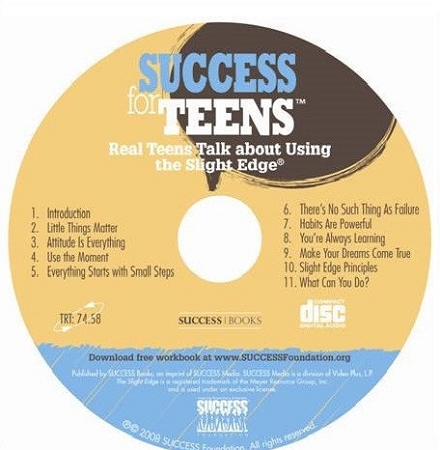 Bases on Jeff Olson's best-selling book The Slight Edge®, the SUCCESS for Teens book and abridged CD make the slight edge philosophy come to life for today's youth. Teens will learn that they can create the life they want, no matter how difficult it may seem, by understanding how small, positive steps make a difference over time. Stop Waiting For Your Life To Happen. Start pursuing Your Dreams Now! SUCCESS for Teens will show your'e teen that success is not about smarts, looks, or luck. Its about becoming the best possible person you can be and making the most of your talents and opportunities. By understanding and now applying the slight edge philosophy, Your'e teen will learn the time-tested principles for excelling in all areas of life. A Startling number of young people say they aren't motivated to achieve, dont know how ot plan or make decisions, and don;t feel a sense of purpose. Thats why Stuart Johnson created the SUCCESS Foundation. he believes that young men and woman thrive best when they first understand themselves and then apply that knowledge to the world around them. He wanted a way to illustrate teh importance of clarifying goals, practicing the small efforts necessary for success, and accepting responsibility for one's own destiny. We believe that every teen needs to be directed toward a path that enables them to achieve their goals, pursue careers, and become productive citizens. The tools for enhancing skills such as goal setting, dream building, self motivation,time management, and creating high self-esteem and a sense of purpose are so very important but often not taught in school. The SUCCESS Foundation believes that providing today's youth with resources such as SUCCESS for Teens will help them reach their full potential. I encourage you to share teh fundamental life-skills and personal-development philosophies found in these pages with your teen. Together, we can help make a difference in the lives of our children. "Success for Teens is relevant to how I think and feel about my possibilities-they are endless. This book gives you the understanding of how to do that... Incredible Read!!" "SUCCESS for Teens offers practical advice and guidance for today's teens about how to excel in the quick-paced world we live in. The book is current and action-oriented, encouraging a proactive approach to self development. I particulary like the chapter on "Everything Starts with Small Steps" as the message appropriately places the emphasis on detail, hard work and the importance of building toward reaching goals the right way. It is an excellent tool and one that high-school and college students can easily read and relate to immediately"
"Kids these days are afraid to laught at themselves, to get the wrong answer or do things independent of other people's processes. SUCCESS for Teens helps them not be afraid to speak their voice. It's Building their self-esteem and shows them that it's the little areas of life that make all the difference in the world. The book is about believing in who you are as a person." "SUCCESS for Teens can be used as a reference guide for oru teens, who unfortunately have a few positive role models. The book helps remind them that success is a day-to-day, step-by-step process." Start Applying The Slight Edge Philosophy Now and Start Making your Dreams Come True Today! Providing teens with the fundamental principles of personal development and the resources to help them reach their full potential. "Sometimes one book can make all the difference in your life."